Stress and work often go hand in hand. For many, as they say, it comes with the job. Experiencing stress doesn’t mean you hate your job, it simply means your ability to cope with your daily dealings could be better. When you’re in the middle of a bad week, here are a few tips that could prove very helpful. Try to identify what’s making work so difficult. If you can, step back and consider the source of your stress. It might be a looming deadline, a micromanaging colleague, or a computer that keeps crashing. You don’t always have to resolve your problem to relieve stress. Sometimes, you just have to pinpoint it. Then you can determine whether the solution is within your control or not. If you need support, reach out and ask for it. For most of us, it feels good to know we can help a colleague in need. But be strategic about it. First, recognize when you need a hand. Then determine which tasks you can safely delegate to others, and which you need to do yourself. Being self-critical is both far too common and terribly unproductive. It’s one thing to make a mistake. It’s quite another to beat yourself up over it. If you do screw up, own it and take the appropriate steps to remedy the situation. Then remind yourself that we’re not judged by the mistakes we make. We’re judged by how we respond to them. Recharge your batteries when they need it. Sometimes it helps to step back from your desk and take a moment. Even if it’s just for 15 minutes or so. Go for a short walk. Get a cup of coffee or tea. Maybe call a friend to say “hello.” That mental break can be just what you need before tackling the tasks at hand. Mindfulness is catching on. Yes, this form of meditation is often viewed as a touchy-feely fad. However, more and more workers are finding it helps them be more productive in the workplace. You can explore mindfulness on your own or take a class. There are even apps that were created to help out. Mindfulness improves your focus, helps you manage stress, and makes it easier to work with others. 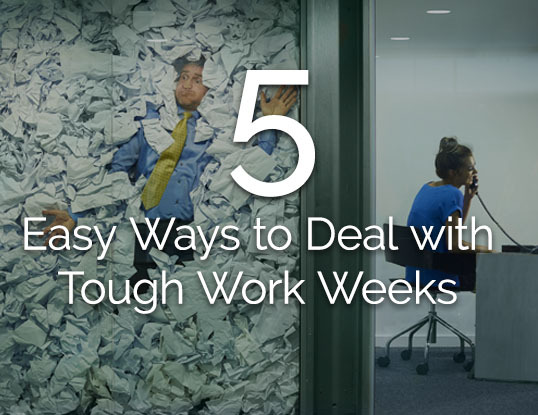 Based on 3 Tips to Help You Get Through a Bad Week at Work by Richard Moy.